Thrombotic microangiopathy can manifest in a diverse range of diseases and is characterized by thrombocytopenia, microangiopathic hemolytic anemia, and organ injury, including AKI. It can be associated with significant morbidity and mortality, but a systematic approach to investigation and prompt initiation of supportive management and, in some cases, effective specific treatment can result in good outcomes. 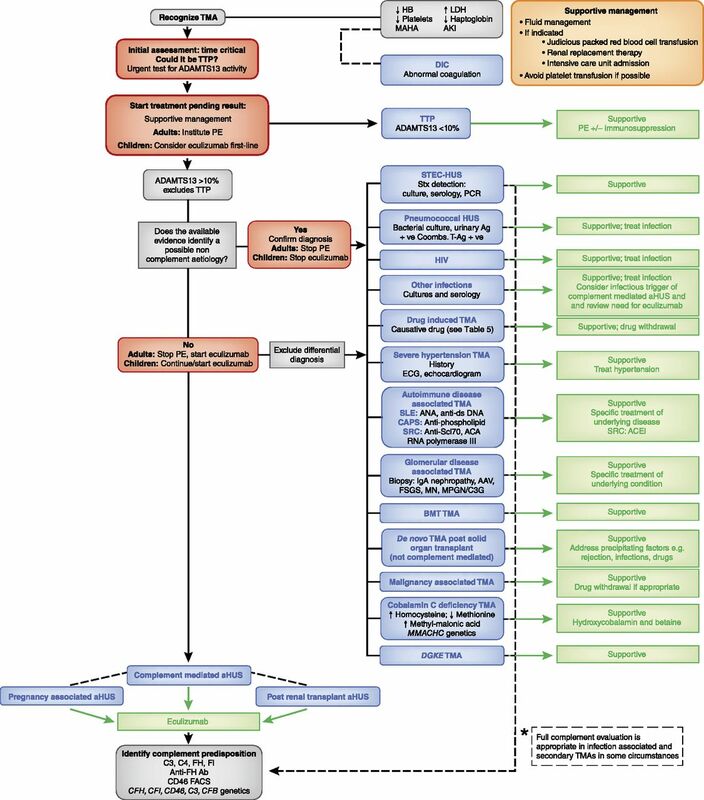 This review considers the classification, pathology, epidemiology, characteristics, and pathogenesis of the thrombotic microangiopathies, and outlines a pragmatic approach to diagnosis and management. Thrombotic microangiopathy (TMA), a pathologic description, is characterized by a clinical presentation with thrombocytopenia, microangiopathic hemolytic anemia (MAHA), and organ injury (1,2). It can manifest in a diverse range of conditions and presentations, but AKI is a common prominent feature because of the apparent propensity of the glomerular circulation to endothelial damage and occlusion (3). Early recognition is important: TMAs are associated with significant mortality and morbidity, including ESRD, although prompt initiation of supportive and specific management can transform outcome. In particular, the prognoses of thrombotic thrombocytopenic purpura (TTP) and atypical hemolytic uremic syndrome (aHUS) have been revolutionized following the elucidation of the pathogenic mechanisms and the introduction of effective therapy. Challenges and controversies remain, however. In this review, we will discuss the classification, pathology, epidemiology, characteristics, and pathogenesis of the TMAs, and outline an approach to diagnosis and management. The classification of the TMAs is challenging and constantly evolving. Historical classifications were on the basis of clinical findings: TTP for predominant neurologic involvement and hemolytic uremic syndrome (HUS) for kidney dominant disease. 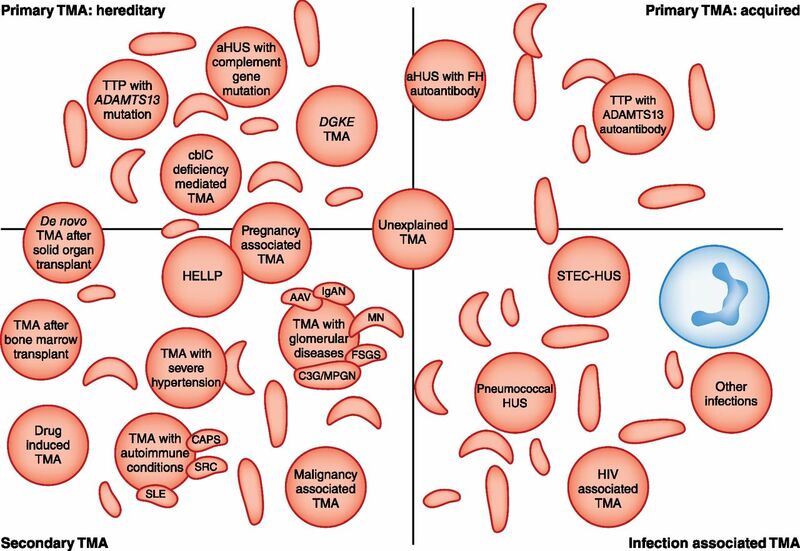 Classifications evolved with greater understanding of the molecular basis of disease: TTP was defined by severe ADAMTS13 deficiency, hemolytic uremic syndrome caused by shiga toxin–producing Escherichia coli (STEC-HUS) was defined by the presence of shiga toxin–producing bacteria, and aHUS was broadly used for all other causes of TMA. The discovery of the role of complement dysregulation in a proportion of patients with aHUS subsequently led to the acceptance of the term complement-mediated TMA to refer to this subgroup (2,4). It should be recognized that differences in the historical and contemporary literature over nomenclature make interpretation difficult: aHUS may refer specifically to complement mediated TMA, or be more loosely applied to any TMA that is not TTP or STEC-HUS. In this review, we adopt the term complement-mediated aHUS when the cause is defined as such, and use aHUS where the cause is ill defined. Current classifications describe primary TMAs, known as either acquired (e.g., factor H (FH) autoantibodies, ADAMTS13 autoantibodies) or inherited (e.g., complement mutations, ADAMTS13 mutations); secondary TMAs; and infection-associated TMAs (2) (Figure 1). Although a useful framework for discussion, these terms do not account for the increasing recognition that patients with an underlying complement risk factor often require a secondary trigger for TMA to manifest. Additionally, with increasing reports of eculizumab nonresponse, a more clinically orientated classification such as eculizumab-responsive and eculizumab-resistant aHUS are likely to be introduced. Thrombotic microangiopathies are classified into: Inherited or acquired primary; secondary; or infection associated TMAs. Current classifications define primary TMAs as hereditary (mutations in ADAMTS13, MMACHC (cb1c deficiency), or genes encoding complement proteins) or acquired (autoantibodies to ADAMTS13, or autoantibodies to complement FH, which is associated with homozygous CFHR3/1 deletion). TMA is associated with various infections: in STEC-HUS and pneumococcal HUS, distinct mechanisms result in TMA; in other infections, the processes are not defined and in some cases the infection may trigger manifestation of a primary TMA. Secondary TMAs occur in a spectrum of conditions, and in many cases the pathogenic mechanisms are multifactorial or unknown. The classification presented here is not unequivocal: in some secondary TMAs, for example pregnancy-associated TMA or de novo TMA after transplantation, a significant proportion of individuals will have a genetic predisposition to a primary TMA. AAV, ANCA-associated vasculitis; ADAMTS13, a disintegrin and metalloproteinase with a thrombospondin type 1 motif, member 13; aHUS, atypical hemolytic uremic syndrome; C3G, C3 glomerulopathy; CAPS, catastrophic antiphospholipid syndrome; cblC, cobalamin C type; DGKE, gene encoding diacylglycerol kinase ε; FH, factor H; HELLP, syndrome of hemolysis, elevated liver enzymes, and low platelets; HUS, hemolytic uremic syndrome; IgAN, IgA nephropathy; MN, membranous nephropathy; MPGN, membranoproliferative GN; SRC, scleroderma renal crisis; STEC, shiga toxin–producing Escherichia coli; TMA, thrombotic microangiopathy; TTP, thrombotic thrombocytopenic purpura. TTP is characterized by unusually large multimers of vWf- and platelet-rich thrombi in capillaries and arterioles (5), although with current practice, pathologic specimens are rarely available. In complement-mediated aHUS and other TMAs with more pronounced AKI, kidney biopsy is more frequently performed, although is not requisite for the diagnosis. The pathologic findings reflect tissue responses to endothelial injury, including endothelial swelling and mesangiolysis in active lesions, and double contours of the basement membrane in chronic lesions (Figure 2) (reviewed by Goodship et al. (6)). Overt fibrin platelet thrombosis may be absent from renal biopsies of TMA, which has recently led to a suggested reclassification to microangiopathy with or without thrombosis (6). Evidence of TMA has also been reported in a number of glomerular diseases (7) and autoimmune diseases; however, in published clinicopathologic studies, only a small proportion of individuals with pathologic evidence of TMA in these contexts had concurrent clinical and laboratory evidence (8,9). It is not possible, on the basis of current knowledge, to establish the cause of TMA from the histopathologic morphology, although this may change with further research (6). The pathological features of thrombotic microangiopathies reflect the tissue responses to endothelial injury. (A) Glomerular paralysis with capillary loops containing abundant erythrocytes (silver, ×400). (B) Thrombus in an artery (hematoxylin and eosin, ×400). (C) Glomerular capillary lumina containing fibrin thrombi (red) and erythrocytes (yellow) (Martius Scarlet Blue, ×400). (D) Erythrocyte fragments within the arterial vessel wall (arrow) (hematoxylin and eosin, ×400). (E) Mucoid thickening and obliteration of the lumen of a small artery (hematoxylin and eosin, ×400). (F) Myxoid intimal thickening of small artery (hematoxylin and eosin, ×400). (G) Fibrinoid necrosis of arterial wall (Martius Scarlet Blue, ×400). (H) Reduplication of glomerular basement membrane (arrow) and fibrillary mesangium (periodic acid–Schiff, ×400). (I) Glomerulus with endothelial swelling and erythrocyte fragmentation (arrow) (hematoxylin and eosin, ×400). (J) Electron micrograph demonstrating fibrin tactoids (black) in glomerular capillary (×10,000). The clinical presentation of TMA reflects hemolysis and ischemic organ dysfunction, and depends on the underlying disease etiology; AKI is a common manifestation of TMAs, although rarely a severe feature of TTP (10). Extrarenal manifestations are reported in thrombotic microangiopathies, with the published data referring primarily to those observed in complement-mediated aHUS and STEC-HUS (Table 1), although it is not known whether they are a consequence of the TMA, a direct effect of complement activation or shiga toxin, or complications of AKI, such as severe hypertension and uremia (6). The defining laboratory features comprise thrombocytopenia, resulting from platelet aggregation and consumption, and MAHA, identified by evidence of erythrocyte fragmentation on peripheral blood film microscopy, which occurs in areas of turbulent flow in the microcirculation due to partial occlusion by platelet aggregates (1). Raised lactate dehydrogenase is a result of cell lysis and tissue ischemia (1), haptoglobin is low, and the direct antiglobulin (Coombs) test is negative (except in pneumococcal HUS). 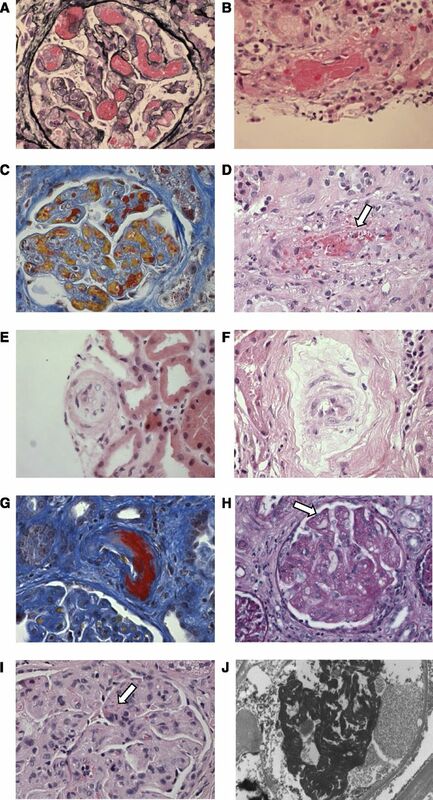 Presentation with AKI reflects the consequences of ischemia in the kidney. Once routine biochemical and hematologic analysis have demonstrated a TMA, investigations are aimed at determining the underlying disease cause and excluding other differential diagnoses, with the most urgent test being an ADAMTS13 assay (Figure 3). The epidemiology, pathogenesis, and management of TMAs are summarized in Table 2. A diagnostic algorithm for the investigation and management of a patient presenting with thrombotic microangiopathy. Supportive treatment is essential. This comprises fluid management and, if indicated, judicious packed red blood cell transfusion, intensive care unit admission, and RRT. Platelet transfusion may worsen the TMA and so should be avoided if possible. The complete evaluation of a patient presenting with TMA comprises complement analysis and investigations for all conditions in which TMA can manifest, and usually enables the disease cause to be established. However, collating the results of the requisite investigations may take considerable time. The clinical evaluation during the acute presentation of a TMA requires some time-critical decision-making, which should focus initially on the consideration of TTP, because immediate management is imperative given the high mortality rate if untreated, and therefore in adults, PE should be instituted on the presumption that it is TTP unless other evidence is available that strongly suggests an alternative cause. In children, in whom TTP is rarer, first-line treatment with eculizumab should be considered if complement-mediated aHUS is suspected and should not be delayed while ADAMTS13 activity is determined. In the absence of a defined cause, complement-mediated aHUS is presumed and treatment with eculizumab is recommended, pending the complete evaluation. Eculizumab is not universally available; in these circumstances, treatment should comprise PE, and there may be a role for liver transplantation. *Full complement evaluation is recommended (Kidney Disease: Improving Global Outcomes consensus ) in individuals with pregnancy-associated aHUS and de novo transplantation-associated aHUS because of the high prevalence of rare genetic variants described in these subgroups, and in cases of STEC-HUS that result in ESRD, as rare genetic variants have been described after HUS recurrence in a subsequent kidney transplant. Additionally, it is recognized that infection can trigger manifestation of complement-mediated aHUS. In other secondary cases of aHUS, insufficient evidence exists to recommend a full genetic evaluation, although rare genetic variants have been described in many of these presentations. In cases where the role of complement is as yet unclear, the clinician should decide on the evaluation on the basis of the potential clinical consequences of a positive result (e.g., listing for renal transplantation). +ve, positive; AAV, ANCA-associated vasculitis; Ab, antibody; ACA, anticentromere antibody; ACEI, angiotensin-converting enzyme inhibitor; ADAMTS13, a disintegrin and metalloproteinase with a thrombospondin type 1 motif, member 13; Ag, antigen; aHUS, atypical hemolytic uremic syndrome; ANA antinuclear antibody; anti-ds DNA, antidouble-stranded DNA; anti–Scl70, anti-topoisomerase I antibody; BMT; bone marrow transplant; C3G, C3 glomerulopathy; CAPS, catastrophic antiphospholipid syndrome; DGKE, gene encoding diacylglycerol kinase ε; DIC, disseminated intravascular coagulation; FH, factor H; FI, factor I; Hb, hemoglobin; HUS, hemolytic uremic syndrome; LDH, lactate dehydrogenase; MAHA, microangiopathic hemolytic anemia; MN, membranous nephropathy; MPGN, membranoproliferative GN; PE, plasma exchange; SRC, scleroderma renal crisis; STEC, shiga toxin–producing Escherichia coli; Stx, shiga toxin; T-Ag, Thomsen–Friedenreich antigen; TMA, thrombotic microangiopathy; TTP, thrombotic thrombocytopenic purpura. Complement-mediated aHUS is prototypical of disease occurring as a consequence of complement dysregulation. The complement system is a regulated cascade network of signaling and amplification that incorporates >30 plasma and cell surface–bound proteins, and was reviewed in detail earlier in this series (11). A key physiologic role involves stimulating the inflammatory response and opsonization and lysis of pathogens to protect the host from infection (encapsulated organisms in particular); it is a fundamental component of the innate immune system, and modulates the adaptive immune system. In addition, it facilitates the disposal of potentially injurious immune complexes and damaged host cells (12). Complement activation is initiated by three pathways: the classical pathway is activated by immune complexes and other molecules (e.g., C-reactive protein), and activation of the lectin pathway results from protein interactions with pathogens (11). The alternative pathway may also be initiated by pattern recognition molecules, but crucially, it is a positive feedback loop that is constitutively active due to spontaneous hydrolysis (tickover) of C3, and is recruited by the classical and lectin pathways; this enables a rapid response against pathogens, but leaves the host vulnerable to bystander damage if the amplification loop is unchecked. The system is therefore tightly regulated by plasma proteins, including FH and factor I (FI), and cell surface proteins, such as membrane cofactor protein (CD46) (13). Defects in these regulators or in the alternative pathway components can lead to complement dysregulation, with activation of the terminal complement pathway and generation of the anaphylatoxin C5a and the membrane attack complex (C5b-9), resulting in a complement-mediated aHUS (Figure 4). The relative roles of these effector molecules in causing disease remains to be established. Unfettered complement activation ultimately results in thrombus formation, platelet consumption, vascular occlusion and mechanical hemolysis. Complement is activated by the alternative, classic, and lectin pathways. The alternative pathway of complement is a positive amplification loop. C3b interacts with factor B, which is then cleaved by factor D to form the C3 convertase C3bBb. Unchecked, this leads to activation of the terminal complement pathway with generation of the effector molecules, the anaphylatoxin C5a and the membrane attack complex (C5b-9). To protect host cells from bystander damage, the alternative pathway is downregulated by complement regulators including factor H (FH), factor I (FI), and CD46. In complement-mediated aHUS, activating mutations in C3 and CFB and loss-of-function mutations in CFH, CFI, and CD46, in addition to autoantibodies to FH, result in overactivation of the alternative pathway. This leads to immune cell and platelet activation and endothelial cell damage and swelling, with consequent thrombus formation, platelet consumption, vascular occlusion, and mechanical hemolysis. There is evidence that complement is activated in other TMAs, but whether this is a causative, disease modifier, or bystander phenomenon has not yet been elucidated. Eculizumab is a humanized mAb that binds to C5 and prevents activation of the terminal pathway; it thereby inhibits the generation of the effector molecules that cause TMA in individuals in whom a primary defect in complement underlies the TMA pathogenesis. Its role in the treatment of other TMAs is undefined. aHUS, atypical hemolytic uremic syndrome; TMA, thrombotic microangiopathy. In complement-mediated aHUS, dysregulated complement activation primarily occurs on endothelial cell surfaces, and although abnormal serum levels of complement components such as C3 may be observed, normal levels do not exclude complement-mediated disease (6,14). There is evidence of complement activation (plasma levels and tissue staining) in many other TMAs, but whether this is a primary event, a disease modifier, or an inconsequential bystander phenomenon has not yet been definitively established (13). Molecular evidence that CFH mutations are associated with aHUS was first described in genetic research published in 1998 (15), and since then a multitude of studies have determined heterozygous pathogenic activating mutations in the genes encoding the alternative pathway components C3 and factor B, and loss-of-function mutations in the genes encoding the regulators FH (including CFH/CFHR fusions), FI, and CD46 (reviewed in Kavanagh et al. ). These genetic mutations are not causative but are instead predisposing, with penetrance incomplete. Penetrance of disease is age-related and has been reported to be as high as 64% by the age of 70 years for individuals carrying a single genetic mutation (6). This suggests that additional disease risk modifiers are important. Around 3% of patients have more than one mutation, with increased penetrance per additional mutation. Haplotypes (particular combinations of single nucleotide polymorphisms) in CFH and CD46 also modify penetrance (14). Together, these still do not answer the question of why some individuals do not develop disease until later in life. This is best explained by the need for an environmental trigger (e.g., pregnancy or infection) to unmask a latent complement defect. Complement activation is a common factor in many of these triggering events: it occurs in the placenta at the fetomaternal interface in normal pregnancy and is the normal physiologic response to infection. Counseling of family members and offering genetic screening are important considerations. Historically the outcome of complement mediated aHUS at the initial presentation was very poor, as were outcomes after kidney transplantation: recurrence was 68% and 5-year death-censored graft survival was 51% (16). The outcome of kidney transplantation is predicted largely by the underlying genetic abnormality, with the highest risk associated with CFH, CFB, and C3 mutations and the lowest with CD46 mutations (17). In the pre-eculizumab era, one option for individuals with a defect in a complement protein predominantly synthesized in the liver (FH, FI, factor B, and C3) was combined liver and kidney transplantation (14); however, short-term risks were significant and international experience was limited (18), and some people were therefore considered to be untransplantable. aHUS associated with autoantibodies against FH was first reported in 2005 (19), and functional analyses have demonstrated disruption of complement regulation by multiple mechanisms (20). There is a strong association with homozygous deletion of CFHR3 and CFHR1, which encode the proteins FHR3 and FHR1 (21), although the mechanism is not understood; CFHR3/1 deletion is a common polymorphism, and it is not present in all individuals who develop FH autoantibodies (22). It predominantly presents in childhood, frequently with a gastrointestinal prodrome. Autoantibodies against FI have also been reported, but they are rare and their functional relevance remains to be established (23). Plasma exchange (PE) still remains the initial treatment of choice until ADAMTS13 activity is available to exclude TTP as a diagnosis. It should be initiated in adults as soon as the diagnosis of TMA is suspected. In addition to removing ADAMTS13 autoantibodies and replacing ADAMTS13 in TTP, PE will also replace faulty complement regulators and remove FH autoantibodies and hyperfunctional complement components in complement-mediated aHUS. In children, PE is associated with a high rate of complications (24) and TTP is rare, therefore PE is not considered as a first-line treatment when eculizumab is available. In many parts of the world, the cost of eculizumab precludes its use, and PE remains the only treatment for complement-mediated aHUS (25). The evidence for the central role of primary complement defects in pathogenesis summarized above provided the mechanistic rationale for treating complement-mediated aHUS with complement-inhibiting therapy. Eculizumab is a recombinant humanized mAb that functionally blocks C5, and trials published in 2013 demonstrated its efficacy (26). Although these were single-arm studies rather than randomized, controlled trials, the historically poor outcomes (up to 77% of patients with CFH mutations had died or reached ESRD by 3–5 years) justified such study designs (27,28). These findings have been replicated in subsequent extension studies (29), prospective (nonrandomized) studies (30,31), and cohort analysis (32). In the prospective trials, complete TMA response was achieved in approximately 65% after 26 weeks of eculizumab therapy in both adults (26) and children (31). Eculizumab was approved by the US Food and Drug Administration and the European Medicines Agency for use in aHUS in 2013 (see Table 3 for practical considerations) (33). In those presenting late in the course of disease who do not recover kidney function, the high recurrence rate after kidney transplantation necessitates preemptive eculizumab (Table 4) (6,16). The trials included patients in whom no complement mutation or FH autoantibody had been identified, and the majority responded to complement-inhibiting therapy; therefore, negative genetic and autoantibody investigations do not exclude the diagnosis of complement-mediated aHUS. The current license for eculizumab is for lifelong treatment, but this is not evidence based. Withdrawal of eculizumab has been described in a large series of patients with aHUS, with relapse reported in around one third, exclusively in those with complement mutations (34). That rapid reintroduction of eculizumab returned kidney function to baseline suggests that a disease-driven intermittent regime could replace long-term therapy, although prospective trials are required. With increased clinical use, evidence is emerging of nonresponse to eculizumab. In the recent pediatric trial, Greenbaum et al. (31) highlighted that, for those with a rare genetic variant in the complement system or an autoantibody to FH, all had an improvement in eGFR, whereas 27% of individuals without an identified complement abnormality failed to show an improvement. It is not clear whether this represents late presentation of disease or true nonresponse. A polymorphism in the C5 gene (p.R885H) has been demonstrated to prevent eculizumab binding to C5 (35), and nonresponders to eculizumab should have genetic screening for this single nucleotide polymorphism and alternative treatment strategies considered. More recently, individuals presenting with a TMA with failure to respond to eculizumab have been demonstrated to have genetic variants in the noncomplement genes DGKE (36) and INF2 (37). The primary concern with terminal complement blockade is increased susceptibility to infection with encapsulated organisms, particularly Neisseria infections (33,38). For this reason, meningococcal vaccination is considered mandatory; however, serologic response is variable (39), and the efficacy of vaccination in the context of complement blockade is uncertain (6). Long-term antibiotic prophylaxis is therefore recommended for the duration of treatment and up to 3 months after withdrawal (6), although meningococcal infection can occur despite these precautions (40,41). Thus, patient education regarding vigilance is essential. Other concerns may become apparent as use of complement-inhibiting therapy in clinical practice expands: hepatotoxicity in association with eculizumab has been reported in children (42), and deposition of eculizumab has been reported in individuals with C3 glomerulopathy (C3G) (but not yet in aHUS), although the clinical significance is unclear (43). The use of complement-inhibiting therapy in TMAs other than complement-mediated aHUS is controversial; case studies have reported success but the inherent publication bias needs to be considered when interpreting these, and given that the role of complement in the pathogenesis of other TMAs has not yet been defined, interventional trials are likely to be needed before a consensus can be achieved (13). TTP is mediated by ADAMTS13 deficiency: in hereditary TTP, this results from recessive mutations (homozygous or compound heterozygous) in the ADAMTS13 gene, and in acquired TTP, ADAMTS13 activity is inhibited by autoantibodies (2). ADAMTS13 is a metalloproteinase enzyme that functions to cleave vWf; deficiency results in unusually large vWf multimers and consequent occlusive microvascular platelet aggregation (2). The incidence of TTP is higher in adults than in children (2), and there is a female predominance (44). Neurologic manifestations are common and laboratory characteristics in comparison to aHUS are reportedly more severe thrombocytopenia (<30×109/L) and less severe AKI (serum creatinine, 1.7–2.3 mg/dl) (45), but these are not absolute and should not be relied upon in clinical practice (10), where the diagnosis is confirmed by ADAMTS13 activity <10% (5). TTP was historically almost universally fatal, but after the introduction of PE treatment, mortality decreased to <10% (46). In acquired TTP, immunosuppressive therapies (e.g., glucocorticoids and rituximab) have reduced the relapse rate (47–49). TMA can manifest in methylmalonic aciduria and homocystinuria, cobalamin C type, which is the most common inherited form of functional cobalamin (vitamin B12) deficiency (50). It is caused by recessive (homozygous or compound heterozygous) mutations in the MMACHC gene, can present in adulthood as well as childhood, and the phenotype may comprise developmental, ophthalmologic, neurologic, cardiac, and kidney manifestations, although severity varies. The pathophysiologic mechanisms that cause endothelial damage and subsequent TMA have not yet been determined (50). Mortality is high if untreated or if there is cardiopulmonary involvement, but metabolic therapy (hydroxocobalamin and betaine) is very effective (50). Recessive (homozygous or compound heterozygous) DGKE mutations causing TMA was first reported in 2013 (36), and this defined a cohort of patients with aHUS caused by complement-independent mechanisms (51). Only a small number of cases have been published, but it appears to present in patients aged <1 year and commonly results in progressive CKD and ESRD (36). There is insufficient evidence to determine optimal management; there are reports of both response (31) and nonresponse (36) to eculizumab, as well as response (52,53) and nonresponse (36) to plasma therapy. Concomitant mutations in complement genes have been reported (54). Genetic pleiotropy is seen, whereby DGKE mutations have also been associated with mesangioproliferative GN (MPGN) (55). Genetic variants in thrombomodulin (THBD) have been reported in association with aHUS (56,57), although this finding was not replicated by Fremeaux-Bacchi et al. (27). Bu et al. (58) reported rare genetic variants in plasminogen (PLG) in aHUS; however, replication analysis will be required to clarify this disease association. Functionally significant mutations in INF2 have been seen to segregate in families with TMAs, but it remains to be seen whether this is a primary TMA or secondary phenomenon in association with FSGS (37). STEC-HUS is more common than aHUS, with a peak incidence in children aged <5 years (Table 2). The predominant causative pathogen is E. coli O157; enteric infection can occur sporadically or in the context of an outbreak, and around 15% of children with enteric infection develop HUS (59). The E. coli O104 outbreak in Europe in 2011 was exceptional because of the high STEC-HUS occurrence rate (24%) and the high proportion of adults affected (60). Shiga toxin translocates through the intestinal epithelium and is thought to bind to leukocytes and circulate to the kidneys (61). The shiga toxin is then internalized via the Gb3 receptor and is cleaved to release a protease into the cytoplasm. This protease inhibits ribosomal function and protein synthesis, leading to cell death. It can also activate signaling pathways, inducing an inflammatory response in affected cells (62,63). The distinction between STEC-HUS and complement-mediated aHUS may not be clinically obvious: approximately 5% of patients with STEC-HUS do not have diarrhea (64), and approximately 30% of patients with complement-mediated aHUS have concurrent diarrhea at presentation (6). Therefore, all individuals with TMA should be investigated for STEC-HUS (Figure 3). Rarely, complement gene mutations are detected, and in these cases the clinical picture is unusually severe (13,65). In STEC-HUS resulting in ESRD, it is recommended to screen for mutations before transplantation. STEC-HUS is considered to be a self-limiting illness, with good outcomes relative to other TMAs: 70% fully recover, the mortality rate is approximately 1%–4%, ESRD occurs in 3% of patients, and CKD occurs in 9%–18% of patients (66). There is some evidence of complement activation (13), but the role of complement-inhibiting therapy has not yet been defined. A case series in 2011 first reported efficacy of eculizumab in three children with severe disease (67), and a significant proportion of those affected in the 2011 E. coli O104 outbreak were treated with eculizumab; no benefit over supportive care or PE was demonstrated in retrospective analyses (60,68,69), although a direct comparison is difficult because of the inherent disadvantages of retrospective analyses, for example there were no controls, patients received multiple therapies administered with inconsistency, and those treated with eculizumab had more severe disease. In this self-limiting condition, only a randomized, controlled trial will resolve this controversy; one is underway in France (Clinicaltrials.gov identifier: NCT02205541) and another is due to start recruiting in the United Kingdom. For now, the recommendation remains supportive management. TMA may occur in adults and children in the context of invasive Streptococcus pneumoniae infection, and the high morbidity and mortality rate usually reflects the severity of the infection (70,71). In a recently published North American cohort, pneumococcal HUS was most commonly observed in children aged <2 years with pneumonia and empyema who were extremely unwell and frequently required prolonged hospitalization and intensive care unit admission; the mortality rate was 3%, and 33% developed ESRD (72). The hypothesized mechanism is that pneumococci produce neuraminidase, which cleaves sialic residues from glycoproteins on erythrocyte, platelet, and endothelial cell membranes, exposing the cryptic Thomsen–Friedenreich antigen (T antigen), to which IgM in the plasma can then bind, resulting in cell damage and TMA (73). The Coombs test is positive. Additionally, it has been suggested that cleavage of sialic acid may reduce FH binding, resulting in impaired endothelial complement regulation, thus contributing to disease pathogenesis (74). Supportive management and treatment of the infection should be the focus. TMA has been reported in association with HIV, more commonly in the pre-highly active antiretroviral therapy era (75–77), and in association with lower CD4+ cell counts and higher viral RNA levels (77). The pathogenic mechanisms are poorly understood, although endothelial damage is thought to be the primary event. Again, there is no evidence for any treatment strategy other than supportive care and antiretroviral treatment. TMA has been reported in association with a wide range of viral, bacterial, fungal, and parasitic infections, although it is frequently unclear if this is a direct effect of the pathogen, a side effect of treatment, or a trigger that unmasks a latent complement defect (reviewed by Nester et al. ). For instance, Caprioli et al. (78) reported undefined infectious triggers in >70% of patients with complement-mediated aHUS and CFH, CFI, or CD46 mutations. Supportive management with appropriate treatment of the infection is recommended, and complement evaluation should be undertaken. The differential diagnosis of TMA in pregnancy includes the primary TMAs complement-mediated aHUS and TTP, as well as the TMA-like presentation occurring in the syndrome of hemolysis, elevated liver enzymes, and low platelets (HELLP) (79), which is part of the clinical spectrum of preeclampsia (80). In around 20% of women with aHUS, the disease onset appears to be triggered by pregnancy, occurring most often in the postpartum period (81,82). Outcomes were historically poor, with 76% developing ESRD despite PE (81). More recently, it has become clear that a high proportion will have identifiable complement mutations (>50%), and that pregnancy acts as a trigger in those with an underlying genetic predisposition (81). In the era of eculizumab, this high prevalence of complement mutations in pregnancy-associated HUS provides the biologic rationale for complement inhibition. Increasing data in both paroxysmal nocturnal hemoglobinuria (83) and aHUS (84) suggests that eculizumab is safe during pregnancy. Similarly, a significant proportion of women with TTP present during pregnancy (80), particularly in the second and third trimesters (81). This might be explained by the physiologic increase in vWf during pregnancy, which consumes ADAMTS13, so in women with a genetic predisposition, its activity can fall low enough for TMA to manifest (81). PE is recommended on the basis of observational data and knowledge of pathogenesis (85). The pathogenesis of preeclampsia and HELLP are poorly understood (80), although there is some evidence to suggest that increased circulating levels of the syncytiotrophoblast- derived antiangiogenic factors, soluble endoglin and the soluble form of the vascular endothelial growth factor receptor (sFlt-1), may contribute to the observed endothelial dysfunction (79,86). Although there is significant overlap in the clinical presentations of HELLP and TMA, in HELLP, the predominant glomerular pathology is endotheliosis (79). In contrast to pregnancy-associated aHUS, only a minority (8%–10%) of patients with preeclampsia and HELLP syndrome harbor complement gene variants, mostly of unknown or nonpathogenic significance (87). There is some evidence that complement is activated in preeclampsia and HELLP, although it is unclear whether it plays a role in pathogenesis; of note, preeclampsia has occurred in women taking eculizumab for paroxysmal nocturnal hemoglobinuria (83) and aHUS (84). Management should be supportive, and the definitive treatment of HELLP is expedited delivery, although expectant management may be considered if the woman is not at or near term (86). In clinical practice, a pragmatic approach is usually taken in peripartum cases of TMA: if expedited delivery does not result in resolution of the TMA then standard management is instituted (Figure 3). In published reports TMA has been associated with a large number of drugs, although definitive causality has only been established in relatively few (reviewed by Al-Nouri et al. ). Drug-mediated TMA occurs by two main mechanisms: immune-mediated damage and direct toxicity (Table 5). For example, quinine induces the development of autoantibodies reactive with either platelet glycoprotein Ib/IX or IIb/IIIa complexes, or both (89). In contrast, IFN-β (90) and bevacizumab (91) cause TMAs by a dose-dependent toxicity. There are no trials to guide management, and the recommendation is supportive care and discontinuation of the causative drug. However, ticlopidine has been reported to be associated with anti-ADAMTS13 antibodies with resultant TTP, and therefore PE is recommended (92). It is crucial that a full evaluation is undertaken (Figure 3) even if drug-mediated TMA is suspected, including an urgent ADAMTS13 assay. De novo TMA has been reported to occur after kidney, liver, pancreas, lung, and heart transplantation (93,94). The pathogenic mechanisms are not well understood, but it is likely to be multifactorial, with ischemia-reperfusion injury, antibody-mediated rejection, viral infections such as cytomegalovirus, and immunosuppressant drugs, especially calcineurin inhibitors (CNIs), contributing to an “endothelial damaging milieu” (95). In one series of de novo TMA after kidney transplantation, complement mutations were identified in 29% (96), providing a rationale for complement-inhibiting therapy especially where the primary diagnosis was not incompatible with complement-mediated aHUS. In many cases, however, supportive treatment and addressing the precipitating factors (CNI discontinuation or dose reduction, treatment of antibody-mediated rejection and viral infections) may be sufficient to stop the TMA (13). A multisystem TMA complicates 10%–40% of allogenic bone marrow transplants (97,98) and is associated with significant mortality, variously reported as 21%–75% (13). Again, this is likely to be multifactorial, with risk factors including CNIs, graft versus host disease, HLA mismatch, chemotherapy, radiation therapy, and infections (99). Rare genetic variants in aHUS associated genes (98) and FH autoantibodies (100) have been infrequently reported in post bone marrow transplant TMA. The optimal treatment strategy remains controversial; favorable outcomes with eculizumab have been described in uncontrolled retrospective analyses (101) and there is some evidence to suggest that complement is activated (13), but prospective trials are likely needed in order to establish a consensus. TMA can occur in association with severe hypertension, and should be managed with antihypertensive and supportive treatment. The pathogenic mechanisms that result in endothelial damage and TMA are unclear (102,103). Conversely, any patient with a TMA can have severe hypertension, thus a clinical conundrum can arise in the initial evaluation of a patient presenting acutely with TMA. In practice, failure of BP control and supportive management to control the TMA will often result in the pragmatic initiating of PE or eculizumab until complement evaluation is available. In the majority of patients with TMA associated with severe hypertension, renal function and MAHA usually recover with management of BP (102,104). In a retrospective case series, genetic analysis identified rare variants in complement genes in patients for whom TMA was initially attributed to severe hypertension; eight out of nine patients progressed to ESRD despite management of hypertension (103). This may be particularly relevant when considering kidney transplant assessment in an individual with ESRD attributed to severe hypertension with TMA, or if TMA occurs again after transplantation. When TMA occurs in association with malignancy it can be difficult to distinguish between TMA caused by chemotherapy and TMA caused by malignancy (105). It is possible that the causative mechanism in disseminated malignancy involves erythrocyte shearing after direct contact with microvascular embolic tumor cells (106). Prognosis is poor because of malignancy-related mortality (107,108), and there is no evidence to support any treatment strategy other than withdrawal of causative chemotherapy agents. TMA can occur in association with IgA nephropathy, ANCA-associated vasculitis, membranous nephropathy, FSGS, and MPGN/C3G, although it may be a histopathologic finding without biochemical or clinical manifestation (13). In MPGN/C3G, the hereditary and acquired complement defects are similar, although subtly different to those seen in complement-mediated aHUS, and it is perhaps unsurprising that concurrent (7) and sequential (109) manifestation of C3G and TMA has been reported. Mutations in CFH are observed in both complement-mediated aHUS and C3G; the reason for this genetic pleiotropy is not fully understood, but the location of the mutation within the gene may be important. In aHUS, the majority of mutations are located at the C-terminal of FH, which binds to C3b and glycosaminoglycans on host cells to mediate cell surface protection (14), whereas in C3G, mutations are more often located at the N-terminal of FH, which mediates complement regulation in the fluid phase (110). Genetic pleiotropy has also been reported in INF2- and DGKE-mediated disease. In addition to the FSGS normally seen in INF2-mediated disease (37) and the MPGN seen in DGKE-mediated disease (55), TMAs have been reported in both cases that seemed nonresponsive to eculizumab. TMA can occur in association with autoimmune diseases including SLE, catastrophic antiphospholipid syndrome (CAPS), and scleroderma renal crisis (SRC); again, the mechanisms remain unclear, although there is some evidence of complement activation in SLE and CAPS (13). For SLE, CAPS, and SRC with TMA, treatment should be of the underlying condition. The influence of TMA on outcome of SLE is uncertain, as case series have reported both no difference and worse outcome (13); treatment should be immunosuppression according to international guidelines, and there is no evidence to suggest that any additional treatment specifically directed at the TMA is beneficial. The high mortality of SRC is significantly reduced with angiotensin-converting enzyme inhibitors (111). In CAPS, the international registry (522 episodes) reported the incidence of TMA to be 14%, and overall mortality was 37%, with no subgroup analysis according to treatment. The most frequent treatment regimens used were anticoagulation plus glucocorticoids (19%) or anticoagulation, glucocorticoids and PE with or without intravenous Ig (18%), with only 0.2% receiving eculizumab (112). There is some evidence from mouse models and observational clinical data that complement may be involved in the pathophysiology of CAPS; successful use of eculizumab has been reported in case reports and series, and a prospective trial of preemptive eculizumab to enable renal transplantation is ongoing (Clinicaltrials.gov identifier: NCT01029587) (13). Establishing the cause of a TMA is usually possible after a complete evaluation. However, the results of the requisite investigations are not available immediately, and in clinical practice, the scenario is often one of a severely ill patient with TMA for whom immediate management decisions are required. The acute decision-making is time-critical: the initial priority should be the consideration of TTP, because urgent management is imperative given the high mortality if untreated, and therefore in adults, PE should be instituted (after obtaining a sample for ADAMTS13 activity testing) on the presumption that it is TTP unless other evidence is available that strongly suggests an alternative cause. If the ADAMTS13 result excludes TTP, then complement-mediated aHUS is presumed and treatment with eculizumab is recommended, pending the complete evaluation. In children, in whom PE may not be appropriate and is high risk, treatment with eculizumab has been recommended by Kidney Disease: Improving Global Outcomes before the availability of the ADAMTS13 result, with the caveat that clinical deterioration on eculizumab should necessitate immediate plasma therapy (6). An algorithm for the real-time investigation and management of a patient presenting with TMA is illustrated in Figure 3. Once the full evaluation has been completed, the indication for eculizumab can be reviewed. In summary, TMA can manifest in a diverse range of diseases and can be associated with significant morbidity and mortality. For some forms of TMA, such as TTP and complement-mediated aHUS, research has now defined the molecular mechanisms of disease leading to targeted therapy and improved patient outcomes. However, the optimal eculizumab treatment duration and the specific patient populations who will benefit remain undefined. D.K. has received honoraria for consultancy work from Alexion Pharmaceuticals, and is a director of and scientific advisor to Gyroscope Therapeutics. V.B. has received funding from the Northern Counties Kidney Research Fund and is a Medical Research Council/Kidney Research UK Clinical Research Training Fellow. D.K. has received funding from the Wellcome Trust, The Medical Research Council and Kidney Research UK.